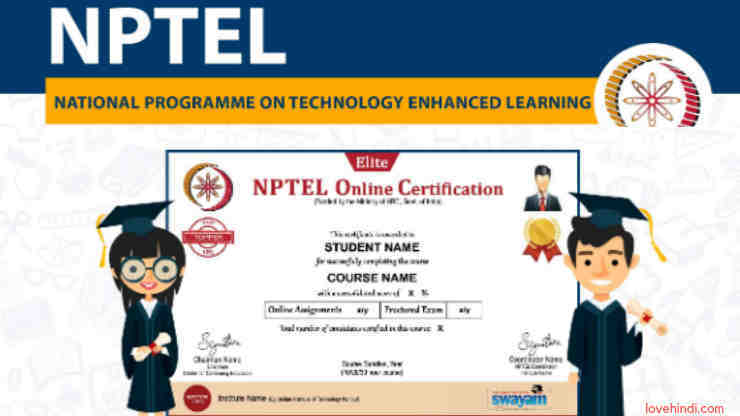 It is now possible for ANYONE outside the IIT System to be able to do an online certification course from NPTEL and get a certificate from the IITs. IITs are reaching out and taking education to the homes of people through this initiative. – Quotes from NPTEL website. NPTEL के पास करंट और कटिंग एज टेक्नोलॉजी पर भी पाठ्यक्रम हैं, जो तकनीकी क्षेत्र में उम्मीदवारों की रोजगार क्षमता में सुधार करेगा, जैसे कि - Internet of Things, Cloud Computing, Data Analytics and Machine Learning, MIMO/OFDM Cellular and Sensor Networks, etc. NPTEL के पास गैर तकनीकी क्षेत्र के भी पाठ्यक्रम हैं l जैसे कि प्रबंधन के कोर्स l जो लोग अपने प्रबंधन कौशल को सुधारने या धारदार बनाना चाहते हैं तो उनके लिए बहुत से लोकप्रिय प्रबंधन कोर्स हैं या अन्य नॉन टेक्निकल कोर्स भी है l जैसे कि - Six Sigma, Educational Leadership, Introduction to Psychology, E-business, Project Management for Managers, History of English Language and Literature, etc.